This tiny cute bar, located just behind the Stanley Hotel, has become my first stop of a regular night out. I normally arrive at 11ish to meet a friend and there I find the whole gang and we start the night. Usually, afterwards we continue to Boiler or Cantina but if we really like it we start and end the night there as well. 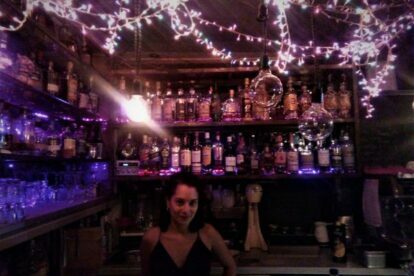 Our friend Eli is at the bar (and in the picture) and her warm welcoming smile guarantees that everyone who goes there will have an awesome night. The music varies quite a lot. On relaxed weekday nights you get anything from indie, psych rock, shoegaze, blues, to even listening to the whole album In the Aeroplane Over the Sea by Neutral Milk Hotel, just because it’s so awesome. Fridays and Saturdays though might have more of a party character with pop hits, trash Greek 80s songs and even Youtube choices from the customers. Though I usually visit this place during the early hours, it’s also nice for a morning coffee or a homemade ginger-lemon juice. Once I went there alone and I sat for 3 hours just watching the tourists in the hotel. I found this somehow relaxing and amusing! Whether you’d like to meet the party people of Athens or you are in this area looking for a decent bar – cafe, this is your spot.